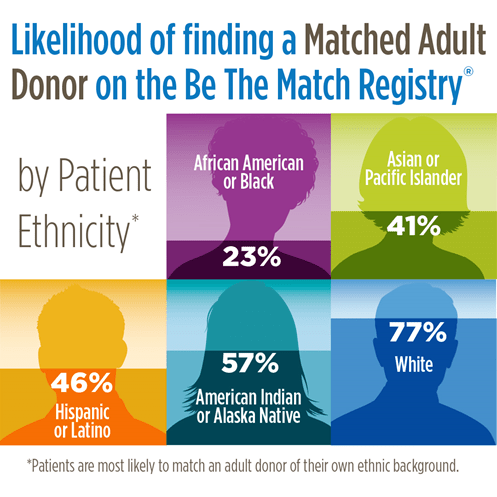 Race, or better yet ethnicity matters when it comes to finding a matching donor. Searching patients are most likely to find the best match within their own race or ethnicity. 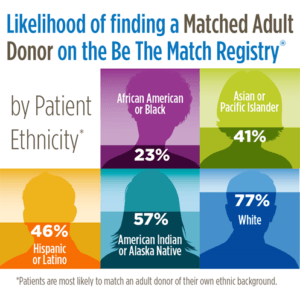 By increasing the diversity of the Be The Match Registry(SM) we can have a positive impact on these figures so that more patients are able to find matching donors. 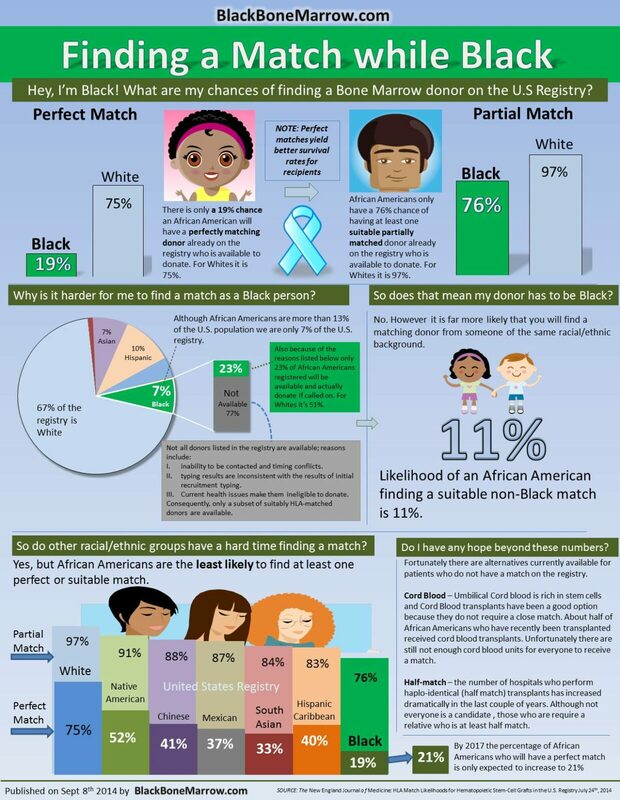 Above is an updated chart on the Be The Match website (bethematch.org) in 2019 with the latest data. Below that is an infographic created by BlackBoneMarrow.com in 2014 using data calculated and published from the The New England Journal of Medicine in July 2014. It does a good job of explaining the data in some detail. Compared to other race groups, African Americans are least likely to find at least one potential match. Even then, in 2010, just under 4 out of 10 patients of all ethnic groups in the U.S. received the unrelated transplant* they needed. This is referring to receiving transplants, not finding matches. . In addition to not having a matched donor or cord blood unit, barriers to transplant include lack of access to health care, no or limited insurance coverage, lack of timely referral for transplant, and decline in health status. The NMDP and DKMS are doing a great job in their efforts to diversify the registry. They have a lot of resources but also have a larger scope when it comes to matching donors to patients. They have both stepped up efforts to register more of every ethnic group which includes some African American specific campaigns. But, due to some of the issues below, there is an obvious need for additional recruiting agencies and strategies for the African American population. 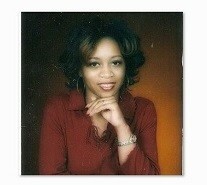 African Americans are simply not aware of the need to join the registry. Most do not even know it exists. We need to bring more attention to this crisis. Today there is no nationwide organization whose sole purpose is to bring awareness of the need to join the registry to the African American community. There are several small active and non-active organizations across the countries that do this. If we continue at this pace it may take several decades to build the registry to where it needs to be. Joining the registry is so simple today that we should already have donors ready for at least 90% of all patients who need one. The need for a better more efficient way to recruit African Americans is apparent. 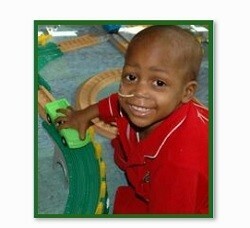 Even as we make are community aware of the need for donors there are other obstacle we must face. African Americans are difficult to convince that they are needed to join and are harder to locate and convince they need to donate once matched. Several studies and reports including those done by the University of Pittsburgh, University of Illinois, and Duke University Medical Center, have concluded what most African Americans already know. There is a deep mistrust of the Medical system among African Americans. Because of past abuses including the infamous “Tuskegee Experiment” we have learned through the years not to trust the system. This culture of mistrust forced us to deal with health issues internally using the best resources we had (family and the church community). But that culture which once protected us from harms way now threatens our ability to receive proper health care and in this case, a life saving marrow transplant. Africans have a greater overall genetic diversity than other population groups in the world (study). This is because the rest of the world migrated from Africa. However Each continent is a total of only some of Africa’s ethnicities. Certain groups went to Europe and others to Asia and beyond. But all can be found in Africa in addition to groups who never left. This leaves Africa with a greater genetic diversity than the rest of the world combined. Because of this African Americans who are mostly of African decent are more genetically diverse therefore making it even more difficult to find matches. What makes things even more interesting is the genetic admixture of African Americans because of European ancestry. According to population researchers at Penn State University Department of Anthropology on average African Americans are 17-18% white. This conclusion came from a study using DNA samples from groups of African Americans throughout the US, West Africa, and Europe. Although not as large, many Black Americans have Native American ancestry as well. This admixture from three continents makes it more difficult to match donors and patients. 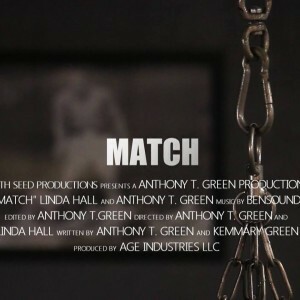 For example ten African American patients will have a lower success rate finding matches in a pool of African American donors than ten Nigerian patients would if were to search a Nigerian pool of donors of the same size. So due to genetic diversity and admixture it will take more possible donors than the norm to find the same number of matches as other population groups. If we are not going to have a strong nationwide organization we must have more communication among the existing and new organizations whose focus it is to recruit African Americans to the registry. Our culture is unique; therefore using mainstream methods are only going to be mildly effective. Connecting patients to existing recruitment organizations should be a priority. Patients who want to get fully involved in recruiting efforts should already know they can go to the NMDP or DKMS, but should also know they can also take advantage of an organization that specializes in the recruitment of African Americans. There is an entire industry that exists to market and advertise commercial products to the Black population. A similar system of proven recruiting guidelines and methods for African Americans needs to be established and refined for the registry. This information should be shared among all of the organizations in the movement. Patient based marrow drives have been the most effective way to register African Americans in large numbers. Many times we need to see and identify the people we are helping. This helps us to look beyond our “mistrust” of the medical system.